Well the kids summer holiday start today and we're off to Italy in one weeks time, I must say I cannot wait. We saw the BBC show on the Millennium Children on Belgium TV last night. The show follows children born in 2000, and tests them and studies them for 25 years. The show stated that the kids in the UK watch on average 3.5 hours of TV a day! Hmm are we bad or good, they seem pretty healthy. Those hard lessons of life! 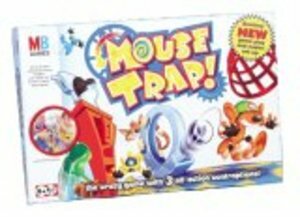 It was all going so well, we'd just eaten our tea and the children got the mousetrap game out. Then after building all the pieces up of this complex classic, Femke landed on the cheese, and Owain her younger brother landed on the turn the wheel square. Oh dear, tears, crying, hiding of her face in my suit jacket! Hmm loosing is always hard to learn especially to little brothers!